One of the cagiest forms of socializing & acculturating to racism & misogyny in a society is through humor. That’s Charlie Hebdo’s schtick. But satire truly is the genre of the oppressed, a way to change power relationships through ridicule. It’s a very democratic form of protest because in tyrannical societies it can get you beheaded or exiled. When satire & ridicule are used against the oppressed by the power elite, it becomes something quite different with a contemptible dynamic of teaching inferiority & social hatred. That’s what minstrel shows were all about in the 19th century US, even after the Civil War. White people in blackface lampooned Black people as lazy, clownish, stupid, & superstitious. The laughter was all at the expense of Blacks, promoting violence against them, & most of all teaching whites & Blacks a sense of Black social inferiority & white supremacy. In the Netherlands, at the same time period, the blackface character of Zwarte Piet (Black Pete), who looks like a lawn jockey, was introduced as a buffoonish, slavish companion to Saint Nicholas when he delivered sweets to children. Those who defend this repugnant practice claim it’s a longstanding tradition from folklore. In fact it originated around the time of the “scramble for Africa”–the invasion, occupation, colonization, & annexation of African territories by European countries. It’s propaganda for colonialism, not folklore. Dressing up as the oppressed has a long inglorious tradition in the US–not just the blackface crap but ‘playing Indian’ which prevails in US culture till today. Turning racism into a joke is part of promoting the ideology of social inferiority & should have no part in children’s games–unless you’re trying to teach kids social hatred. There has been growing opposition by anti-racist activists in the Netherlands to end this practice & drop Zwarte Piet (Black Pete) from the Saint Nicholas festivities. Even a UN agency chimed in demanding it end as a racist practice. But it’s role as socializer to racism is seen by the power elite as invaluable because without it they would have to express the full brunt of social malignancy & that would show their hand. 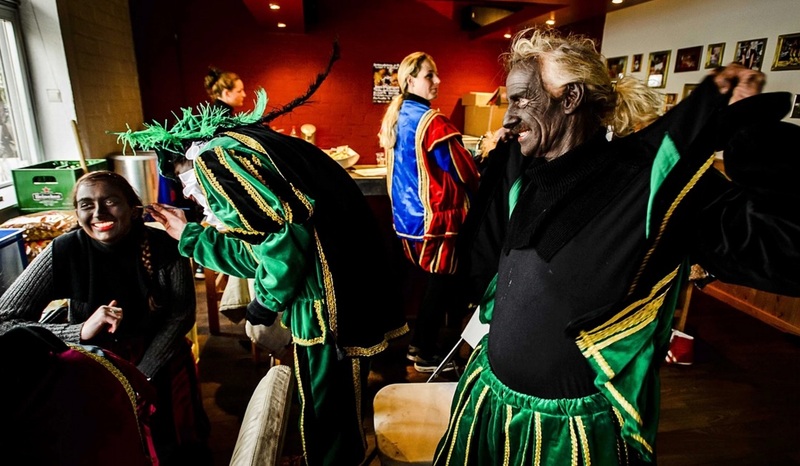 Photo is of people dressing as ‘Zwarte Piet’ (Black Pete) to celebrate the feast of Saint Nicholas. There are knuckleheads everywhere willing to play a role for social inequality–not realizing that in a strategy of divide & conquer, the last laugh will be on them. Redneck is an epithet in US culture for a white working class reactionary. Some consider it derogatory of working people. Since I have relatives who fit the bill, I’m not that sensitive. It aptly describes a type. The eruption of violent rhetoric directed at Muslims since San Bernardino is way beyond redneck stuff but draws on the cesspools of fascism & includes the highest levels of power in this country. Even Islamophobia is too weak a word. We had comments by Trump about special databases & id cards for Muslims & from Ben Carson that a Muslim could only be US president if he or she “renounced the tenets of Islam.” It took the FBI one day to conclude on the basis of a shred of evidence that the shootings were Muslim-related. Jerry Falwell, Jr., the president of a right-wing religious college said “if more good people had concealed-carry permits, then we could end those Muslims before they walked in.” Presidential candidate & former NY governor George Pataki tweeted “We must declare war on radical Islam. @Loretta Lynch I’m not edging toward violent speech, I’m declaring we kill them. Go ahead, arrest me.” FB is filled with memes declaring we kill Muslims before they kill us. Spreading fear of Muslims & making ignorant, asinine assertions about Islam as a hateful, “jihadist” religion is a very dangerous strategy unfortunately protected by freedom of speech. But openly promoting gun violence against them is a criminal act akin to shouting “fire” in a crowded theater. Post on xenophobia & criminality of Jeanine Pirro hits a sore spot with right-wingers. Tough noogies. On a post I did about the xenophobia & criminality of Judge Jeanine Pirro, I got hit with an avalanche of right-wingers. Usually I have no problems with a public wall but anti-Muslim sentiment is riding high right now & loudmouths & the deranged apparently identify with it. They seem to communicate only in CAPS & memes. Why they’re incensed enough to evangelize on my wall beats me. I come from a family of right-wingers & I’ve never understood the psychology. Or is it a pathology? I’ll likely hit the grave before I’ve grasped its inner essence. At least I hope so. Anyway, I’ve blocked & deleted most of the comments but left a few so we get a look at what we’re up against politically. Muslims in the US don’t stand alone. There are millions of civil libertarians & people of good will who stand with them. We need always keep in mind that the force which drives social hatred back under its rock is political power which we much mobilize against war, for immigrant & refugee rights, & in defense of the Bill of Rights for all.